A couple of years later, I was visiting London and mentioned this fact to Alan [Officer, master of the Freeworld site and fellow Kirsty fanatic]. He in turn mentioned it to Kirsty, who sent me an email inviting me to meet her and hear some tracks she was working on (which would become Tropical Brainstorm). Alas, she sent it to my work email address and I didn't see it until after I'd returned. Much gnashing of teeth! In 2000, I was back in the UK again and hoped the opportunity would arise once more. I planned to go and see Kirsty in concert in Sheffield and London, and Alan passed on the message that Kirsty would be happy to meet up with me in Sheffield. Alas, the bouncers refused to listen to my pleas and by the time I found the stage door, Kirsty and the band had already left. More gnashing! In London, I managed to finagle my way into the post-tour party in Camden Town, and finally got to meet Kirsty. She immediately knew who I was, and rushed to introduce me to James -- she seemed very happy and proud to be with him. She introduced me to her PR flack ("She used to do the Spice Girls, so obviously I'm an improvement!") and we chatted briefly. Like most record industry bashes, it was hot and noisy and we didn't get much chance to talk. Kirsty suggested I email her and that we meet up in a pub somewhere the following week for a less frenzied chat. Alas, she got called away for PR in Italy and it never happened. I consoled myself with the thought that it would always be possible the next time I was in London. Of course, that was never to be. Nonetheless, I remain grateful that I got to meet her at all, and astonished that she was happy to hook up with her fans so readily (especially given the lyrics of 'Treachery', which she wrote after I'd first been in email contact with her -- I've always hoped I wasn't part of the inspiration). 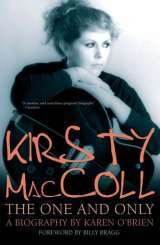 Picking a single Kirsty track is really difficult, but I'm very often drawn back to 'Still Life'. My first exposure to Kirsty was via her French and Saunders appearances, and it was a source of frustration to me for years that I couldn't find a CD version of this beautiful and underrated ballad. It even inspired me to visit Milton Keynes to see if it deserved the trashing it gets in the song. Of course, it does, but it wasn't until I visited that I realised that the 'sacred cows' line could be taken as a reference to the city's infamous concrete cows -- I thought it was simple Thatcher bashing, which Kirsty also did very well!